Baumer: The trend on truck-mounted concrete pumps is for greater reach with less weight. Technical advances at Schwing are currently making it one of the market leaders in this field. In order to raise operator comfort levels on truck-mounted concrete pumps with large booms, the company has launched an innovative vibration damping system. Schwing, in partnership with Baumer Electric AG, has developed a new strain sensor with an IP69K protection rating and an exceptionally broad measuring range to provide precise signaling of deflections as they occur in the boom. Since its formation in the 1930s, the German group of companies has been designing, constructing and selling pumps, machines and plant equipment for the production, transport and reprocessing of concrete: batching plants, truck-mixers, stationary and truck-mounted concrete pumps as well as recycling plants. Whether concreting a swimming pool in the front garden of a family home or realizing prestigious public projects such as the One World Trade Center in New York, USA, or the third Bosporus bridge in Turkey, the machines and plant are deployed wherever concrete is used to provide permanent stability. With six manufacturing sites and subsidiaries or representatives in more than 100 countries, the company provides efficient, reliable and long-term solutions throughout the world. Extensive in-house production capacity for core components guarantees strict inspection processes and high product quality. Truck-mounted concrete pumps of various sizes and types are manufactured at sites in Herne (Germany), Chennai (India), and Sao Paulo (Brazil). The models with the longest placing booms are manufactured at the SCHWING Group’s German headquarters. With a new boom drive concept, high-strength steel, less weight, and more operator comfort, they are Schwing’s answer to the market's increasing demands in terms of economics, ecology and ergonomics. “We developed a customer-specific, innovative strain sensor in close collaboration with Baumer Electric AG which comfortably overcomes all the challenges,” explains Reiner Vierkotten, Senior Engineer Control Systems at SCHWING GmbH. “The new high-strength steels we have used allow the mechanical stresses and elongations to take place in higher areas than in previously used materials. Conventional strain sensors cannot operate in these areas.” A completely new set of sensor mechanics was developed using FEM simulations with a measuring range of ±?2000 µm/m. The easy-to-mount sensor with long-term seal functions perfectly in multi-shift operation in spite of the tough conditions on building sites. It is calibrated at the factory which speeds up installation and any possible replacement work. The new sensor, with its on-board electronics, supplies a high-resolution digital CANopen signal directly to the truck-mounted concrete pump’s control system. Compared to force sensors, which have to be precisely adjusted to the machine geometry, the strain sensor can be easily mounted at the optimum position with just two bolts. This does not affect the structure of the machine, save times in development and makes mounting easy. The robust design of the sensor makes it impervious to shocks, impacts, and other mechanical influences and is therefore ideal for use in the construction environment. At the same time, it is very gentle, reacts quickly, and can accurately detect even the slightest elongation or compression. 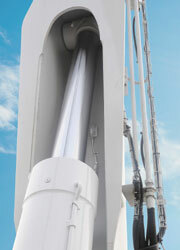 It is resistant to wind and weather due to its a corrosion-resistant housing. With a certificated protection class of IP69K, its seal is absolutely guaranteed and can be cleaned with high-pressure or steam cleaning systems. The Baumer Group is an international leading manufacturer and developer of sensors, encoders, measuring instruments and components for automated image-processing. Baumer combines innovative technology and customer-oriented service into intelligent solutions for factory and process automation and offers a uniquely wide range of related products and technologies. With around 2,300 employees and 37 subsidiaries and in 19 countries, the family-owned company is always close to the customer. Industrial clients in many sectors gain vital advantages and measurable added value from the worldwide consistency of Baumer’s high quality standards and its considerable innovative potential. For further information, visit www.baumer.com on the internet.